Since I can remember I have always had a beautifully organised underwear drawer. I remember at University my flatmates would give me a hard time about how I "colour coordinated" my underwear. Most of the girls I knew just threw everything into a drawer. I think most women dream of having the most gorgeous underwear and have it displayed beautifully in drawers. The reality for most of us is that we don't!. It's seems that because our bras and undies may not match and are often a bit tired that we do not think to be "beautiful with what you have." ...Now that is a great catch phase "be beautiful with what you have"
The truth is that I don't spend a fortune on my underwear. It is always purchased on sale, yes I even get the 5 for $35 undies at Cotton On Body. I do however take the effort to have matching sets in terms of colours and I do try and get lovely colours, mainly tones of blue. Yes some of my items are tired however I still like to open my drawer and have it look beautiful. So just because you don't have expensive luxury underwear it does not mean that you can't have it displayed beautifully. At the end of the day, they have to be put away in a drawer, so why not make it look pretty so you can enjoy it every time you open it. More importantly I actually find this way of organising them so much better because I can easily see what I have and get to it quickly, so the other benefit, besides prettiness is the functionality and usefulness. There are three basic steps that I do to"be beautiful with what I have" . 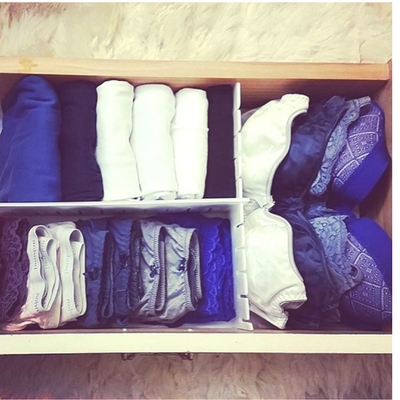 You can do this with any drawer of clothes that you want to tidy. Before I do anything to organise or sort things, I always declutter. I just take out everything and decide what is worth keeping and bin the rest. There are often pieces that we simply should not be wearing any more. Then I sort them into types , bras, undies and singlets and then into colours. I like to go from light to dark in my colours, it just looks nice. In actual fact I do not fold my bras, it's better for them to try and keep them open as it helps to keep the shape. However this would depend on the space that you have, as you may have to fold them. With the undies I fold them so the front is on display, often this is where a small bow or jewel is, so again it looks pretty when you place them together. The singlets I fold sides into the middle, fold in half and then fold length ways in three, this way you get them to actually stand up and you can see the colours easily. I believe this is know as the KonMari method. I do use drawer dividers as I find them really helpful as they stop items from moving about and really helps to contain the items. You can pick these up from any $2 store, these are the ones I use. A handy hint is to cut down the ends of shoe boxes as they do pretty much the same thing. Decide how you want to organise them and then just place them in. You can see from my picture below how I organise mine and it works perfectly! Happy sorting, folding and stacking!